In the 10 years or so prior to original publication in 1978 new theories and discoveries in the social sciences had given a scientific basis and new impetus to the development of social skills training as a form of therapy. This book explores the progress made with this idea and gives practical guidance for therapists based on several years’ experience with the technique. 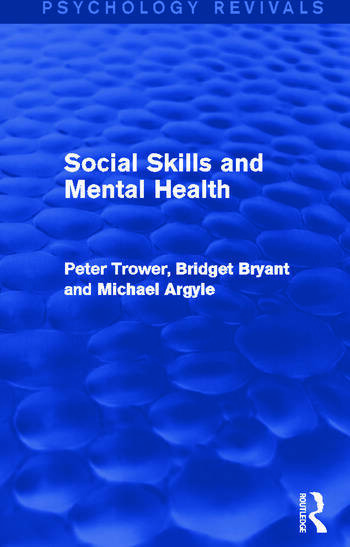 The book provides an account of the latest ideas at the time, about the analysis of social behaviour – non-verbal communication, social skill, rules, analysis of situations, etc. The different techniques for training and modifying social behaviour – some old, some very new – are described and compared, with detailed accounts. There is a careful critical review of follow-up studies of social skills training and other forms of social therapy on in-patients, out-patients and volunteer subjects. The second part of the book consists of a manual for assessing deficits and difficulties, and for training in ten main areas of social deficiency such as observation, listening, speaking, asserting and planning. A rating scale, questionnaire and user’s booklet of training exercises is included. The book should be of interest, not only to psychiatric professionals – psychiatrists, clinical psychologists, psychiatric nurses, occupational therapists – but to many others, such as social and community workers, teachers, prison officers, and lay people who may be interested in forming self-help groups, either on their own or with professional guidance. Part One 1 The Social Skills Training Approach 2 The Analysis of Social Behaviour 3 Development and Deficiency in Social Skills: A Review of the Evidence 4 Changing Social Behaviour 5 Outcome Studies of Skills Training: A Review by John Marzillier Part Two 6 Assessment 7 Training. Author Index. Subject Index.